Legendary musician, producer and composer, Nile Rodgers will be coming to Kuala Lumpur for a night of groove and disco spectacular on December 4 at the iconic KL LIVE. Organized by Livescape Asia, the ‘Chic featuring Nile Rodgers’ show will see Rodgers perform some of his chart-topping hits alongside his band, Chic. From Chic’s ‘Le Freak’, ‘Good Times’, ‘Everybody Dance’ and ‘I Want Your Love’ to the amazing Sister Sledge hits ‘We are Family’ and ‘He’s the Greatest Dancer’ of the 70’s disco charts through to his unstoppable array of 80’s hits made along with legends like Diana Ross’ ‘I’m Coming Out’ and ‘Upside Down’, David Bowie’s ‘Let’s Dance’, INXS’ ‘Original Sin’, Duran Duran’s ‘The Reflex’ and Madonna’s iconic ‘Like a Virgin’, fans can expect a journey through time of disco-tastic fever. His influence today is stronger than ever as he is the man responsible for Daft Punk’s worldwide hit ‘Get Lucky’ which has reached number one in an unprecedented 79 countries! His golden touch of making and performing on record breaking hits continues with current collaborations with some of dance music’s greatest DJs and acts including the likes of Avicii, David Guetta and Chase and Status. “We are thrilled to announce that the Chic featuring Nile Rodgers show will be making its way to our shores. It is going to be a night you won’t want to miss. Expect a journey of spectacular music from the disco years of the 70’s and 80’s to some of Nile Rodgers’ fans-favorite hits. Nile is a true icon and legend having produced, composed and recorded music for some of the greatest artistes in the world in addition to inspiring the music scene and movement through his undoubted talent. The show that you will see will also be the very same show that has been touring in some of the biggest festivals and concert halls in the world”, Adam Mathews, Director of Livescape Asia says. Having headlined some of the world’s largest festivals including Glastonbury, Bestival and the i-Tunes Festival as well as selling out incredible venues such as the Sydney Opera House, the live show in Kuala Lumpur will probably be one of the most entertaining, glorious celebrations of music the country will ever see. The show will also feature a full nine-piece band including a brass, percussion and backing vocals. 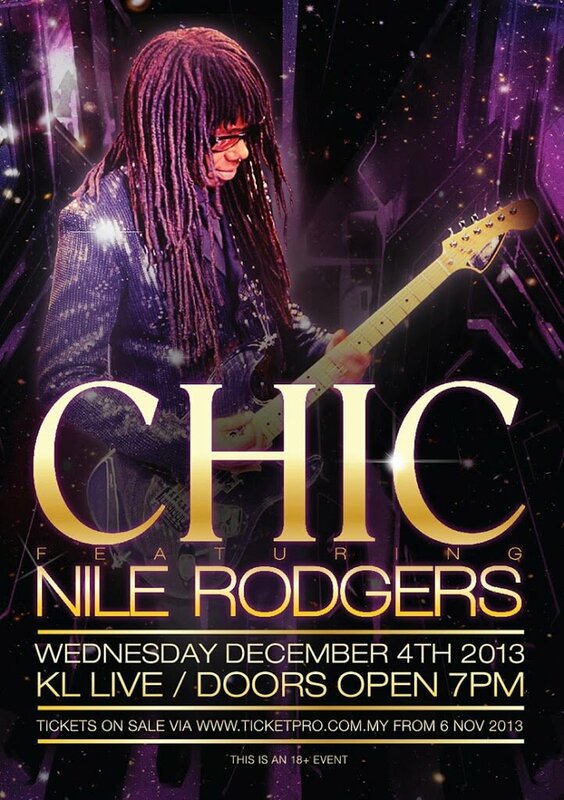 Tickets to the ‘Chic featuring Nile Rodgers’ show at KL LIVE on December 4 will be on sale at www.ticketpro.com.my from November 7 onwards. 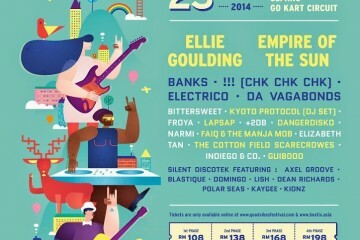 Tickets are priced at RM150 (General Pre-Sale), RM180 (General At-The-Door) and RM500 (VIP). For more information or to obtain updates on the ‘Chic featuring Nile Rodgers’ show in Kuala Lumpur, logon towww.facebook.com/livescapeasia or www.nilerodgers.com.